Anyone who knows Mr. Green Bean pictures him in his Boston Red Sox baseball hat. Actually, he has many hats. One for when he plays tennis, one for long car rides, and one for going out on the town. But each one is a navy cap with that iconic, red, embroidered “B”. What’s confusing is that Mr. GB is not from Boston. It is the city where we met (aw) and spent the first few years of our “adult” lives. It is the town near which Ma and Pa Green Bean grew up, obliviously crossing paths with Ma and Pa Glutie Foodie, funny enough. While Mr. GB grew up in the Midwest, and has now lived more years in Washington DC than he did in Boston, it is the scarlet “B” that he proudly wears morning to night. Mr. GB’s hat is evidence of Boston’s contagious and lasting charm. Mr. Green Bean and his hat saw me off as I boarded a train the weekend of the Boston Marathon bombing. I was headed to Boston to spend time with my hometown loved ones and hopefully help them move past the week’s horrid events. Dr. Glutie Foodie’s prescription for the weekend was good food and company. I arrived at Boston Correspondent, a.k.a. Souper Girl‘s, apartment bearing g-free brownies and a bottle of prosecco. The next morning, Souper Girl was prepared with a reservation for a festive brunch at her new favorite haunt, Barcelona, in Brookline, MA. The Barcelona Wine Bar and Restaurant group was founded in 1995 by Sasa Mahr-Batuz and Andy Pforzheimer who aimed to bring authentic Spanish and Portugese flavors to the States. With locations in Brookline, MA, Atlanta, GA, and throughout Connecticut, the group is quickly expanding and has a fall 2013 opening planned for the Logan Circle neighborhood of Washington DC. The Brookline location is large, with dark wood covering every surface from floors and walls to tables and chairs. Light pours in through large windows that line the front of the space, looking out onto a patio and outdoor bar area to accommodate those few beautiful months of warm Boston air. We found the service abundantly friendly as the manager showed us to our table and our server warmly greeted us. Souper Girl could hardly contain herself as she described the tapas she has enjoyed at numerous visits since the restaurant’s recent opening. Her excitement grew as she salivated over the brunch items she had yet to try. Our server was patient and informative as we asked our share of g-free questions and deliberated our order back and forth. 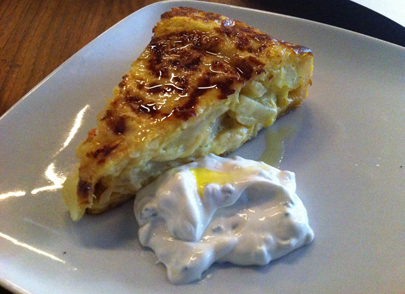 We agreed to start with the Potato Tortilla with chive sour cream. The dish was a delicious version of the Spanish classic, with large pieces of potato fused together by creamy egg filling and complimented by refreshingly cool and herbaceous sour cream. We were tempted by the Char-Grilled Lamb Burger, fare g-free game without the crispy shallots, french fries or bun. 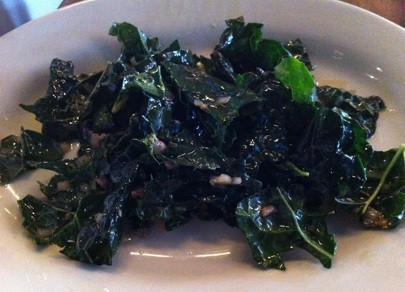 As a substitute, we ordered a side of the Kale Salad with anchovy vinaigrette (and no breadcrumbs). The salad arrived well before the burger due to a kitchen miss-understanding. In true tapas style we ate in whatever order the plates arrived, digging into the bright green leaves subtly flavored by small flakes of anchovies and onions. The otherwise light salad was heavily tossed in an unnecessary amount of olive oil. 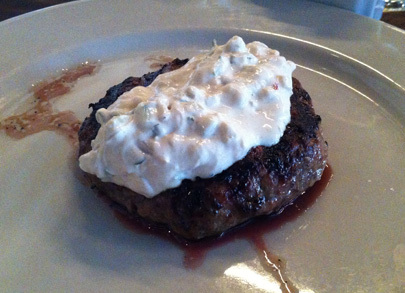 Our burger arrived next, looking lonely on the plate without an accompaniment other than a generous heaping of tadziki. The meat was dripping with juice, its rich lamb flavor enhanced with garlic and salt to deliver an eye popping delight. The creamy cucumber sauce balanced the burger’s intensity. Last to arrive was the Golden Beet Salad with blood orange and pistachios. 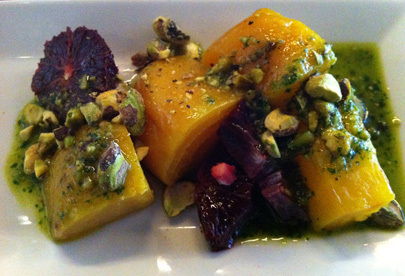 Large sections of sweet yellow beets were paired with deep red orange slices, topped with a pesto dressing and a sprinkling of crunchy pistachios. While a nice earthy contrast, the oily dressing was, again, a bit too plentiful. (Someone on the sauce station must have a heavy hand). With no room left for dessert, we sipped our coffee and tea while chatting with management about Barcelona’s much anticipated Washington debut. It will be interesting to see if the reasonably priced Boston menu (a very attractive feature) will transfer to the slightly pricier DC scale. Regardless, I plan to be first in line, with Mr. Green Bean and his Bean Town cap in tow. Even my picky husband is sure to find plenty of satisfying options at this charming American recreation of La Rambla, Barcelona. Categories: 3 Spoons, Bar, Brunch, Connecticut, Georgia, Gluten-Free, Small Plates, Spanish, Tapas, Washington DC | Permalink.